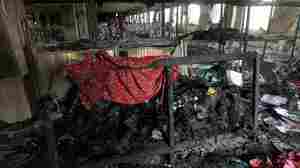 November 26, 2012  More than 100 workers died in Saturday's blaze, at a factory that had previously been cited as a "high risk." Clothes were made there for retailers in the U.S. and around the world. Today, thousands of workers protested and hundreds of factories were shut down.